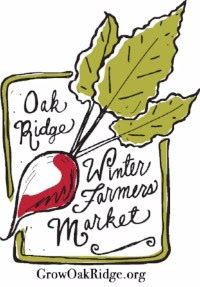 The Winter Farmers Market by Grow Oak Ridge, LLC opens for its second season on Dec. 2, offering fresh, locally grown farm products indoors all winter to Oak Ridge. The market will open Dec. 2, and following Saturdays through February, from 10 a.m. to 1 p.m., in the gym at St. Mary’s School, 323 Vermont Ave., Oak Ridge. It is closed Dec. 23 and Dec. 30. “Plus, we’re really excited to be able to offer the regional ‘Fresh Savings Program’ this year,” Williams added. The program doubles a shopper’s SNAP (food stamp) benefits, up to $20 for fruits and vegetables. On opening day, customers can enter a free drawing for 20 Market Dollars. The drawing is a noon, and you can also enter at www.GrowOakRidge.org. Some of the products available this year include a wide range of winter greens like salad mixes and kale, greenhouse tomatoes, free range eggs, local honey, baked goods, and ethically raised meats, including grass-fed and grain-fed beef, lamb, pork, chicken and even tilapia.The market also features alpaca wool knitted items, hand sewn and wooden crafts. The ever-popular VGs Bakery is returning, plus there are two other bakeries as well. Food trucks are invited to serve outdoors, and there’s an indoor eating area as well.